Asia is one of the world’s most vulnerable regions to climate change, but due to its rapidly growing economies, it is also an increasing user of energy, water and other resources. Developing Asia’s share of global energy-related carbon dioxide emissions more than doubled from 17% in 1990 to 37% in 2010, and is expected to increase to about 47% by 2035. Lives and livelihoods in rural areas are threatened by changing weather patterns as it can disrupt farming, cause floods or droughts. Given this backdrop, SEAS, together with the Asian Development Bank (ADB) came together to launch the Sustainable Energy Centre of Excellence (SECOE) on the 19th of March 2015. SECOE aims to equip policy makers in the region with information and share experiences on matters of policy, technology and project financing in the sustainable energy sector. 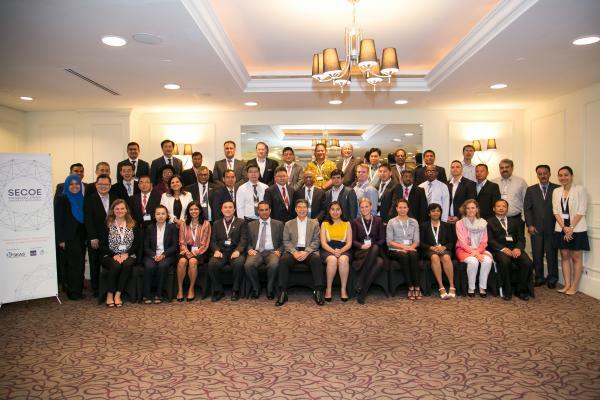 Based in Singapore, SECOE will hold seminars, workshops and sharing sessions for up to 150 policy-makers from ADB’s 46 developing member countries a year. SECOE is the first training centre of its kind to build capabilities, drive partnerships and bring key decision makers together under a structured programme in the field of clean and renewable energy. The Singapore government represented by IE Singapore, is a supporting partner for SECOE and welcomes the collaboration between officials from the region and industry. We conducted the very first workshop from the 27th to 31st July 2015. Click here to read the key event highlights, and click here to view pictures from the workshop. Also visit SEAS' Facebook page for more pictures.